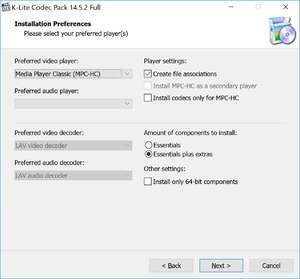 The K-Lite Codec Pack is a collection of freely distributed codecs for Windows which make playing over 99% of popular file formats a cinch. Installation of this product is extremely quick and easy and after you've completed the installation wizard, you should be able to play virtually all media files requiring special codecs not included with Windows. Support for DivX, XviD, MKV, MPEG and virtually everything else is included, making K-Lite the only codec pack you're ever going to need to install. For security reasons, you should also check out the K-Lite Codec Pack download at LO4D.com which includes virus and malware tests. Additional screenshots of this application download may be available, too. K-Lite Codec Pack has a presence on social networks.